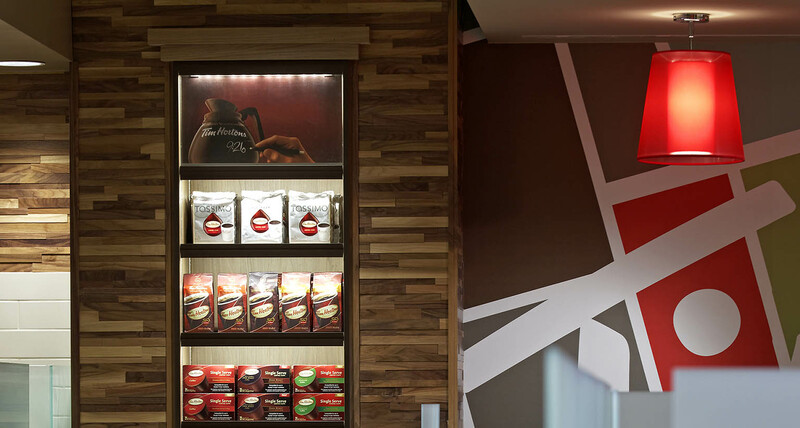 Shikatani Lacroix was retained by Tim Hortons to develop a new retail concept design for urban locations in a changing Canadian coffee shop and restaurant landscape. 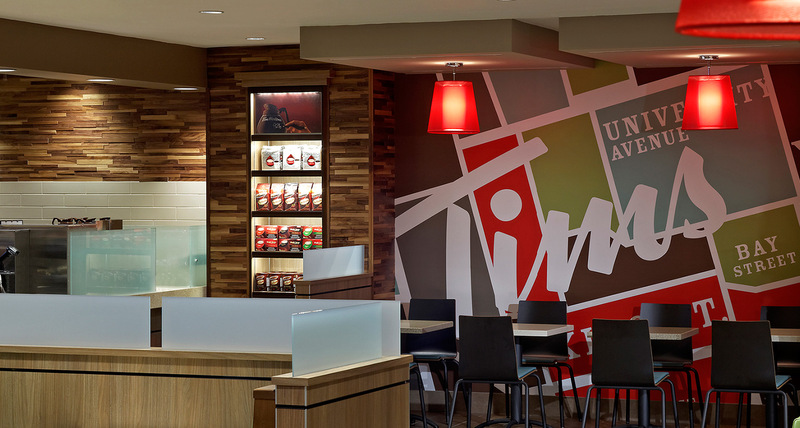 The goal was to improve the experience within Tim Hortons urban locations and create design that would fit well within the urban landscape, and would appeal to the urban customers. 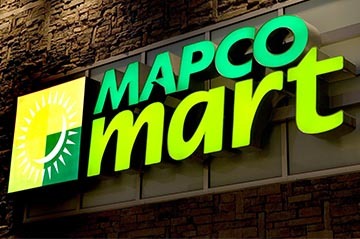 The goal of the project was to develop options for an urban facility concept that would provide the chain with better location options and increase visibility of the brand in urban markets. 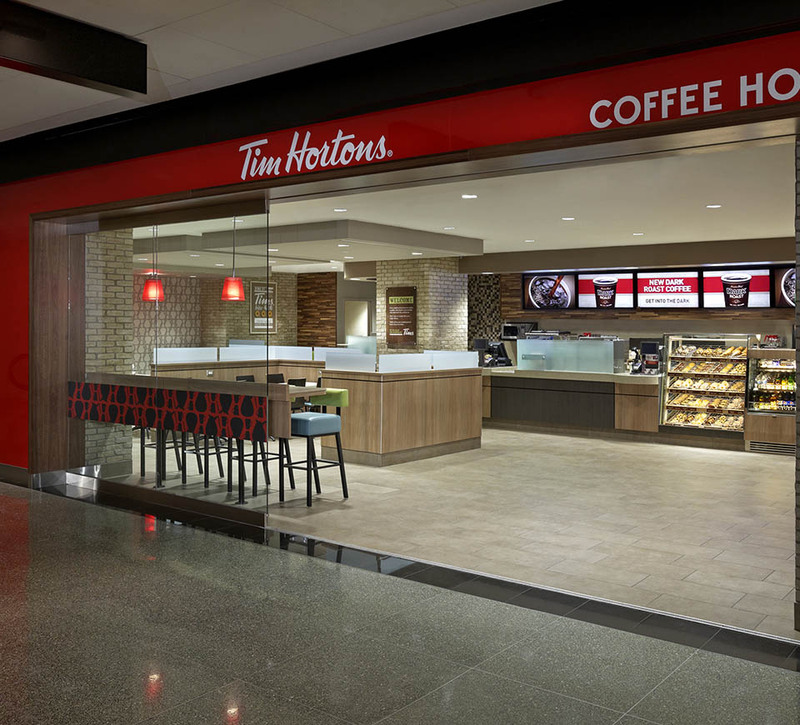 The program was designed to ensure that the Tim Hortons brand remains relevant in markets where the consumer segments may be coming from office and professional environments, appeal to younger demographics, and locations where the competitive set consists of specialty coffee shops and major cafe chains. 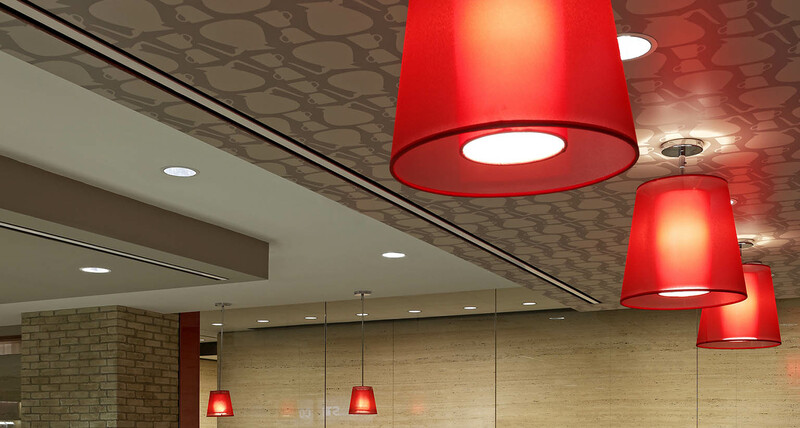 The client sought to create modernized concept that would fit with the more upscale urban locations and bring additional appeal to the urban population. 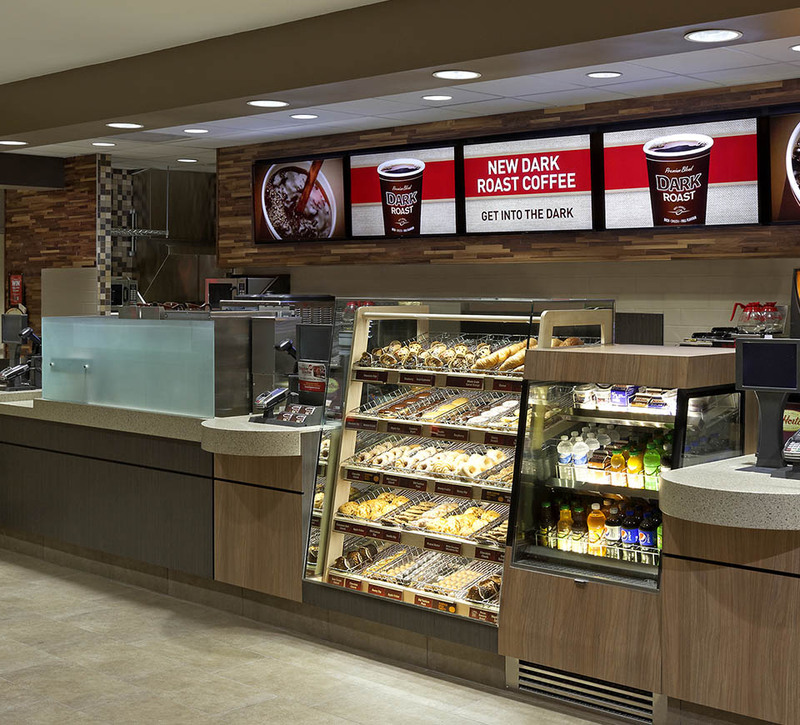 Shikatani Lacroix worked with the client to determine the key upgrades the client sought to address, and also determine which winning customer opportunities the new design should cater. 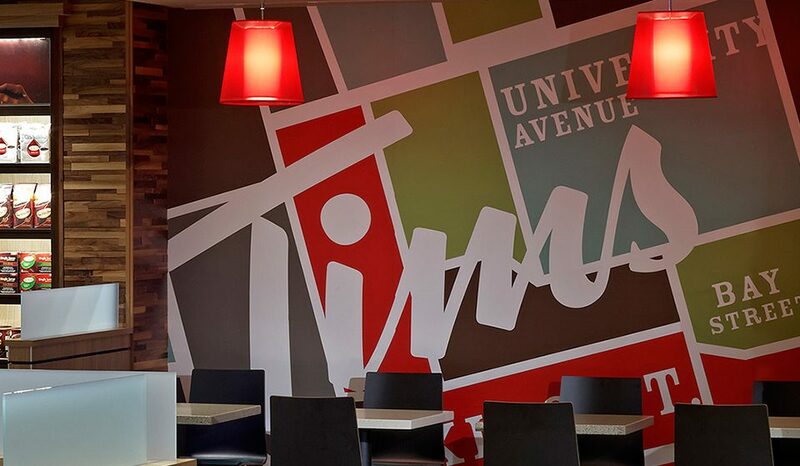 The time of day represented one of the design considerations, offering solutions to a variety of opportunities during the mid-afternoon breaks, weekend afternoon meet ups, and nighttime date and study times. 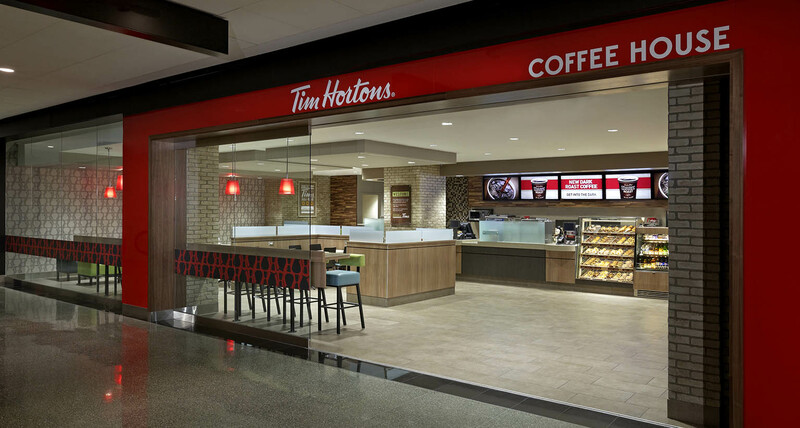 The goal was also to expand the target demographics by attracting urban couples, urban Gen Y, and non-Tim Hortons brand loyalists. Shikatani Lacroix determined what would an urban consumer perceived as an authentic, relevant, and genuine destination. 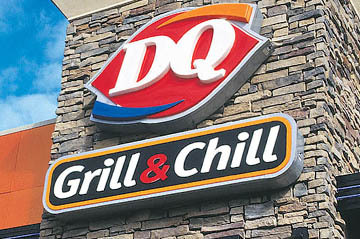 The new design needed to reach beyond the grab-and-go, and become a place that would go beyond a quick break from daily duties, and that would have the potential to become a place to hang out, socialize, relax, work, read, spend a weekend afternoon or bring a date. 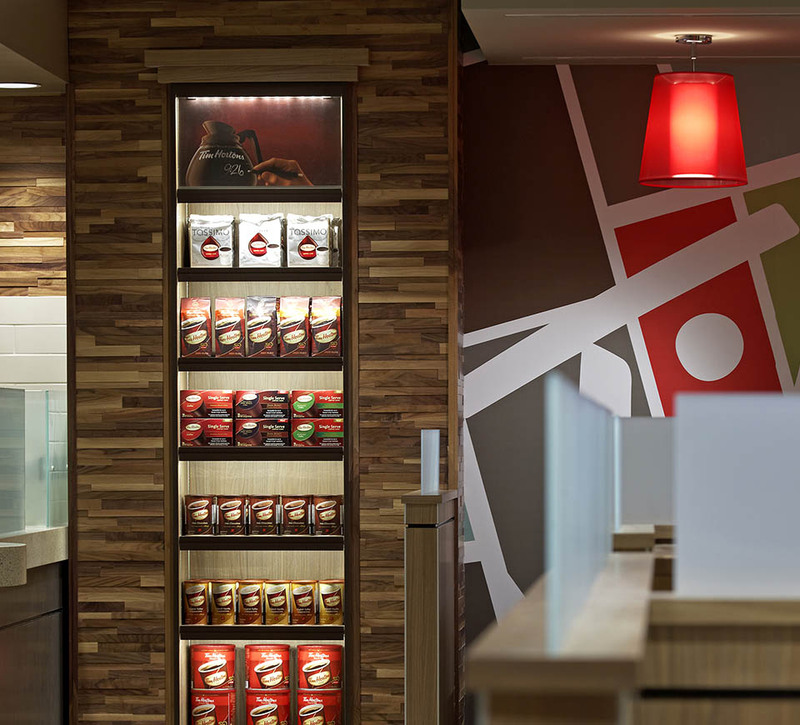 Using Tim Hortons’ design direction, Shikatani Lacroix developed full design intent drawings, which detailed items such as the floor plan layouts, decor posters and graphics, lighting, wall coverings, flooring, millwork finishes, paint finishes, and vinyl upholstery. 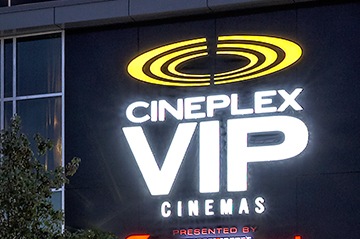 The new design featured customized light fixtures, unique tabletop graphics, eye-catching graphic posters, updated millwork, improved seating, and handy power outlets. 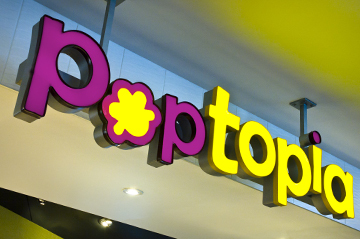 Beyond design, service considerations had to be made in order to attract the more experienced urban customer. 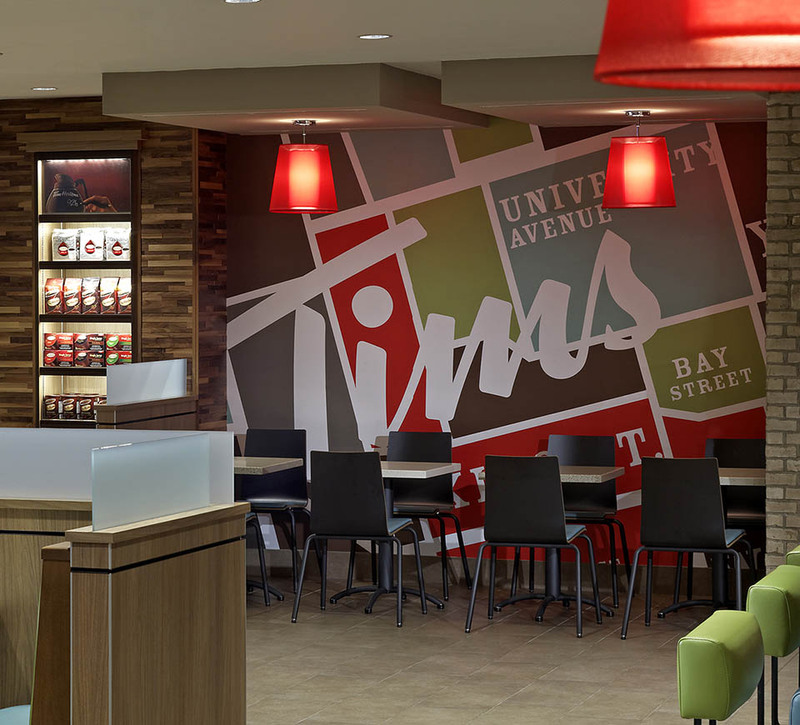 While the traditional Tim Hortons offers customers product, speedy service, utilitarian visit, and provides more substance than style, in order to cater to the urban dweller, the brand had to cater to customer who favours experience over product, quality of service over speed, and who expects both substance and style. Shikatani Lacroix developed individual brand stories that described the customer experience, and created the design renderings and mosaic boards that enabled easy visualization of the building exterior, interior, signing and wall graphics, and overall personality were created for each of these positions. These sets were then validated and measured in the research phase in order to ensure stakeholder approval and help to further refine design direction. 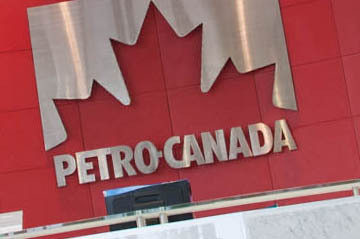 The client selected the “Home Away from Home” position as the wining concept, and some favourable elements from the other positions were identified and integrated into the final design. 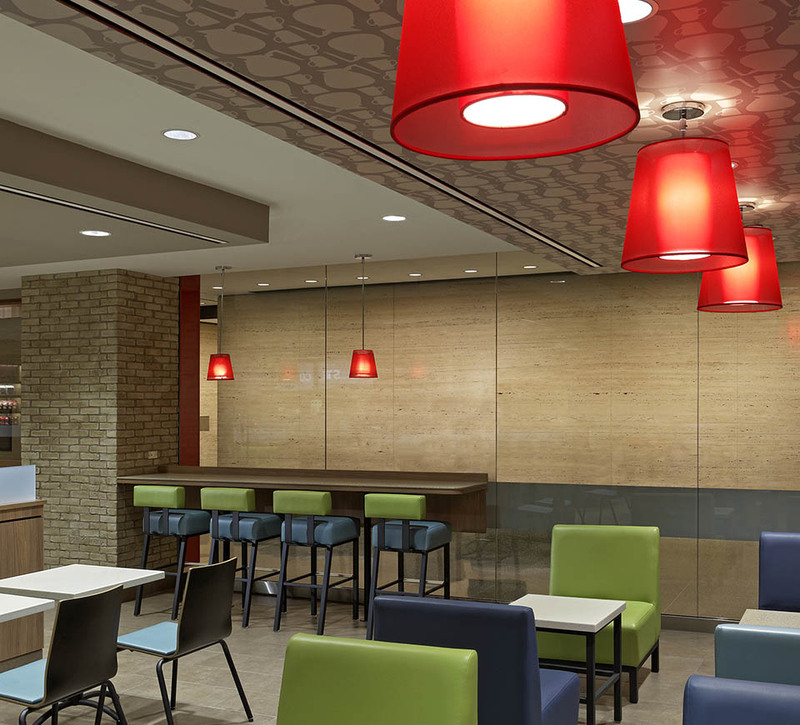 This concept offers urban dwellers a place to unwind and recharge with a cup of coffee, and provides a place to spend time, meet with friends, read a book, or work. The concept offered a variety of lighting options, allowing guests to choose their seat according to their purpose of stay, choosing brightened spaces for work, or dimmer areas for more intimate settings, as well as a variety of seating options, hard seating at the front of the restaurant that serves the guests who stopped for a quick meal, and more comfortable seating in the back of the restaurant for guests planning to stay for a longer period of time to work or socialize. 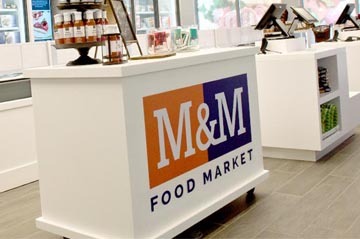 The position also focused on increasing the level of service, with heightened attention of staff to the guests present in the restaurant, and offering the option of the table service without guests having to return to the line – a home away from home. 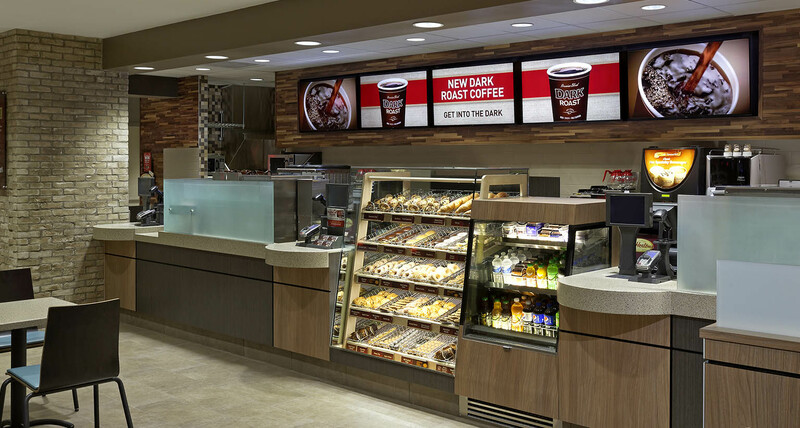 The client executed the developed concept, and the new Tim Hortons urban design has been implemented in several locations in Toronto by the end of 2014.